1492 - Christopher Columbus lands and names the island Hispaniola, or Little Spain. 1496 - Spanish establish first European settlement in western hemisphere at Santo Domingo, now capital of Dominican Republic. 1697 - Spain cedes western part of Hispaniola to France, and this becomes Haiti, or Land of Mountains. 1801 - A former black slave who became a guerrilla leader, Toussaint Louverture, conquers Haiti, abolishing slavery and proclaiming himself governor-general of an autonomous government over all Hispaniola. 1802 - French force led by Napoleon's brother-in-law, Charles Leclerc, fails to conquer Haitian interior. 1804 - Haiti becomes independent; former slave Jean-Jacques Dessalines declares himself emperor. 1818-43 - Pierre Boyer unifies Haiti, but excludes blacks from power. 1915 - US invades Haiti following black-mulatto friction, which it thought endangered its property and investments in the country. 1934 - US withdraws troops from Haiti, but maintains fiscal control until 1947. 1956 - Voodoo physician Francois "Papa Doc" Duvalier seizes power in military coup and is elected president a year later. 1964 - Duvalier declares himself president-for-life and establishes a dictatorship with the help of the Tontons Macoutes militia. 1971 - Duvalier dies and is succeeded by his 19-year-old son, Jean-Claude, or "Baby Doc", who also declares himself president-for-life. 1986 - Baby Doc flees Haiti in the wake of mounting popular discontent and is replaced by Lieutenant-General Henri Namphy as head of a governing council. 1988 - Leslie Manigat becomes president, but is ousted in a coup led by Brigadier-General Prosper Avril, who installs a civilian government under military control. 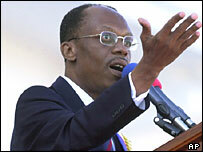 1990 - Jean-Bertrand Aristide elected president in Haiti's first free and peaceful polls. 1991 - Aristide ousted in a coup led by Brigadier-General Raoul Cedras, triggering sanctions by the US and the Organisation of American States. 1994 - Military regime relinquishes power in the face of an imminent US invasion; US forces oversee a transition to a civilian government; Aristide returns. Rene Preval, from Aristide's Lavalas party, is elected in December to replace Aristide as president. 1997-99 - Serious political deadlock; new government named. 1999 - Preval declares that parliament's term has expired and begins ruling by decree following a series of disagreements with deputies. 2000 November - Aristide elected president for a second non-consecutive term, amid allegations of irregularities. 2001 July - Presidential spokesman accuses former army officers of trying to overthrow the government after armed men attack three locations, killing four police officers. 2001 December - 30 armed men try to seize the National Palace in an apparent coup attempt; 12 people are killed in the raid, which the government blames on former army members. 2002 July - Haiti is approved as a full member of the Caribbean Community (Caricom) trade bloc. 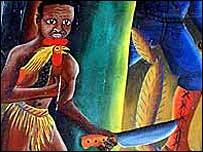 2003 April - Voodoo recognised as a religion, on a par with other faiths. Mandate set to expire in October 2008, "with the intention of further renewal"
2004 January-February - Celebrations marking 200 years of independence turn into uprising against President Aristide, who is forced into exile. An interim government takes over. 2004 May - Severe floods in south, and in parts of neighbouring Dominican Republic, leave more than 2,000 dead or disappeared. 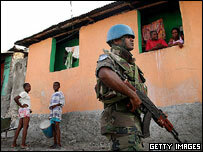 2004 June - First UN peacekeepers arrive, to take over security duties from US-led force and to help flood survivors. 2004 July - International donors pledge more than $1bn in aid. 2004 September - Nearly 3,000 killed in flooding in the north, in the wake of tropical storm Jeanne. late 2004 - Rising levels of deadly political and gang violence in the capital; armed gangs loyal to former President Aristide are said to be responsible for many killings. 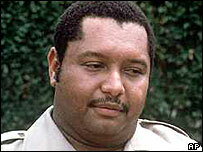 2005 April - Prominent rebel leader Ravix Remissainthe is killed by police in the capital. 2005 July - Hurricane Dennis kills at least 45 people. 2006 February - General elections, the first since former President Aristide was overthrown in 2004. Rene Preval is declared the winner of the presidential vote after a deal is reached over spoiled ballot papers. 2006 June - A democratically-elected government headed by Prime Minister Jacques-Edouard Alexis takes office. 2006 September - Launch of a UN-run scheme to disarm gang members in return for grants, job training. 2006 October - US partially lifts an arms embargo, imposed in 1991. 2007 January - UN troops launch tough new offensive against armed gangs in Cite Soleil, one of the capital's largest and most violent shantytowns. 2008 April - Food riots. Government announces emergency plan to cut price of rice in bid to halt unrest. Parliament dismisses Prime Minister Alexis. 2008 May - US and World Bank announce extra food aid totalling 30m dollars. In response to plea from President Preval for more police to help combat wave of kidnappings-for-ransom, Brazil agrees to boost its peacekeeping force. 2008 August/September - Nearly 800 people are killed and hundreds are left injured as Haiti is hit by a series of devastating storms and hurricanes. 2008 September - Michele Pierre-Louis succeeds Jacques-Edouard Alexis as prime minister. 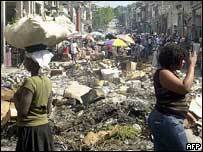 2008 November - A school in Port-au-Prince collapses with around 500 pupils and teachers inside. The authorities blame poor construction methods. 2009 May - Former US President Bill Clinton appointed UN special envoy to Haiti. 2009 July - World Bank and International Monetary Fund cancel $1.2bn of Haiti's debt - 80% of the total - after judging it to have fulfilled economic reform and poverty reduction conditions. 2009 October-November - Jean-Max Bellerive becomes prime minister after the Senate passes censure motion against his predecessor, Michelle Pierre-Louis. 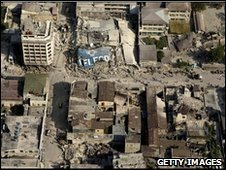 2010 January - Up to 300,000 people are killed when a magnitude 7.0 earthquake hits the capital Port-au-Prince and its wider region - the worst in Haiti in 200 years. US takes control of the main airport to ensure orderly arrival of aid flights. 2010 March - International donors pledge $5.3 billion for post-quake reconstruction at a donor conference at UN headquarters. 2010 July - Popular anger grows over slow pace of reconstruction six months after quake. 2010 October - Run-up to presidential, parliamentary polls due on 28 November. Concern over exclusion of popular candidates. 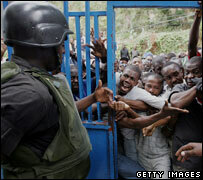 2010 October-December - Cholera outbreak claims some 3,500 lives and triggers violent protests. 2010 November - Presidential and parliamentary elections. 2010 December - Announcement of inconclusive provisional results of presidential election triggers violent protests. 2011 January - Former president Jean-Claude Duvalier returns from exile, faces corruption and human rights abuse charges. 2011 March - Michel Martelly wins second round of presidential election. 2011 May - Mr Martelly takes up office as president. 2011 July - Death toll from cholera outbreak climbs to nearly 6,000. 2011 October - President Martelly appoints UN development expert Garry Conille as his prime minister, after parliament rejected his two previous nominees. 2012 January - Presidential Martelly proposes reviving Haiti's army, which was disbanded in 1995 because of its role in coups and its history of human rights abuses. 2012 February - Prime Minister Garry Conille resigns in protest at the refusal of many of his ministers and the presidential administration to cooperate with a parliamentary inquiry into dual citizenship among senior officials. 2012 May - Parliament approves Foreign Minister Laurent Lamothe as prime minister. 2012 October - Hundreds protest against the high cost of living and call for the resignation of President Martelly. They accuse the president of corruption and failure to deliver on his promises to alleviate poverty.